Human centric lighting is a new term used to discuss lighting purposely designed to help us feel and perform better. It relies on a combination of intensity and colour spectrum to produce a photo-biological response. The info stream highlights STG Aerospace’s research into how humans interact with light and how this can be used to improve the passenger experience within the aircraft cabin. Human centric lighting is all about providing the right light, at the right time. STG Aerospace is contributing to the research pool by investigating stress and relaxation at all stages of the flight and assessing how these physiological responses relate to light. 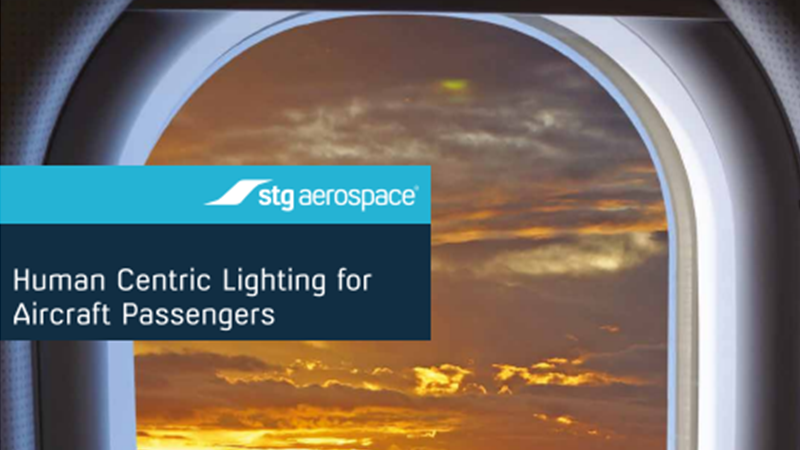 This research will help STG Aerospace to deduce how to best use lighting to enhance the air-travel experience for the passenger. This info stream demonstrates how simple and standardised lighting solutions provide the best results for our 300+ airline customers. You can download this info stream here or you can pick up a copy from the STG Aerospace stand at Aircraft Interiors Expo next week in Hamburg.